The Carolina Charter Tercentenary Commission was established by the 1959 General Assembly in order to plan for observations of the 300th anniversary of the signing of the Carolina charter in 1663. The celebration centered on educational and public observances of the first century of the colony's official existence. Pamphlets, brochures, and leaflets were prepared for various age levels. A 30-minute motion picture was produced, as was a one-act historic opera (The Sojourner and Mollie Sinclair, by Carlisle Floyd), and a symphony (North State). A mobile Museum of History toured the state displaying historical artifacts. A literary competition, religious commemorations, a commemorative postage stamp, and local county observances were important components of the celebration. One enduring contribution of the Tercentenary Commission was the construction of a building to house the State Archives, a museum of history, and other historical agencies. The groundbreaking ceremony for such an edifice took place in October 1963. The commission also sparked a new edition of The Colonial Records of North Carolina; in 1961 the North Carolina Colonial Records Project came into being, and the first of the project's nine volumes was published for the tercentenary in 1963. Carolina Charter Tercentenary Commission. Report of the Carolina Charter Tercentenary Commission. Raleigh, N.C.: State Dept. of Archives and History. 1964. http://archive.org/details/reportofcarolina00caro (November 5, 2012). "An Act to Appropriate Funds to the Carolina Charter Tercentenary Commission." Session laws and resolutions passed by the General Assembly. Winston-Salem. N.C.: Winston Printing Company. 1961. p.1474. http://digital.ncdcr.gov/u?/p249901coll22,385452 (November 2, 2012). Futrell, Madlin. "Governor and Mrs. Terry Sanford lead the procession of costumed officials at ceremonies held Jan. 4 at the Executive Mansion to inaugurate the year-long observance." 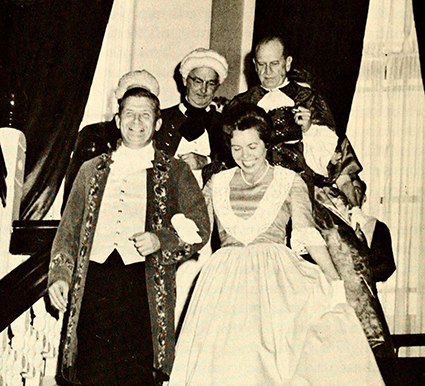 Report of the Carolina Charter Tercentenary Commission. Raleigh, N.C.: State Dept. of Archives and History. 1964. p. 4. http://archive.org/details/reportofcarolina00caro (November 5, 2012).